One of my favorite dishes to order at Thai restaurants is their spicy rice noodle dish! And for some reason, I love eating the shape of flat rice noodles, so this is my version of the recipe. The sauce for this recipe is comprised of the same sauce ingredients I use to make Thai Basil Eggplant – Hoisin sauce, soy sauce, chili sauce, and cornstarch! I typically love adding broccoli to this dish because of how well the florets absorb the flavor of the sauce. 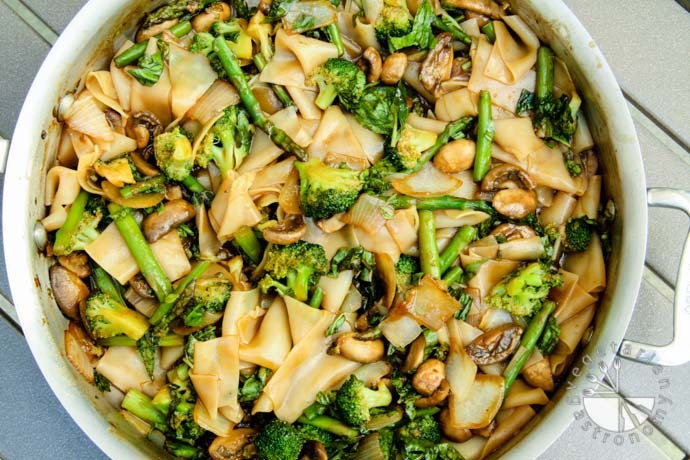 In the past, I’ve found that broccoli, along with asparagus and mushrooms, makes for a perfect medley of vegetables to add to most saucy Thai dish. 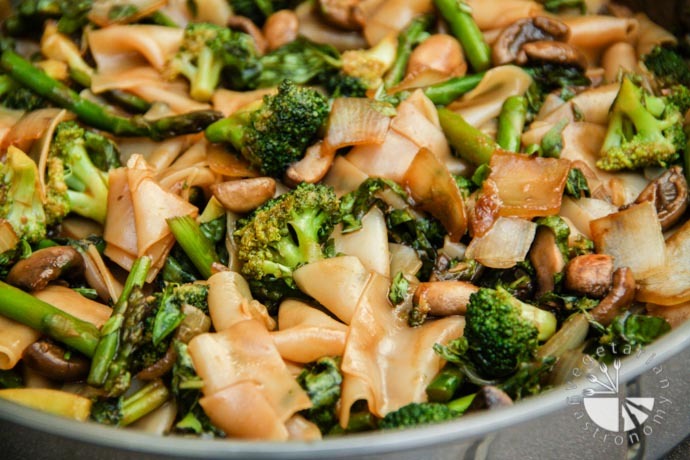 This trio of vegetables work well together, especially in this noodle dish! I usually make these flat noodles along-side some Garlic Pepper Tofu or Sweet Chili Lime Tofu, and quinoa or brown rice. If you’re looking for an awesome Hoisin Sauce, I highly recommend the one by Koon Chun. For a gluten-free Hoisin Sauce, I recommend the one by Sun-Luck (I found this brand at my local Ralphs). Both of these Sauces are on the sweeter side, so if you’re using another brand, make sure that it is also on the sweet side otherwise the flavor of the sauce combination below may not work well. This is yet another simple, tasty, quick, and delicious Thai dish to add to your selection! Bing a large pot of water to boil. Add some vegetable oil and salt. Add the rice noodles and cook according to package, stirring frequently (note: rice noodles cook pretty quickly so be sure not to over cook them otherwise they will become mushy). Once the noodles are cooked, drain, wash with cold water, and toss with some vegetable oil to keep them from sticking together. Set aside. Trim the bottom ~1-inch of the asparagus spheres and discard. Chop the remainder of the asparagus spheres into 2-inch pieces. Dice the mushrooms into 4 sections. Cut and trim the broccoli into medium sized florets. In a large non-stick skillet or wok, heat 2 Tbsp. of vegetable oil on medium heat. Add the garlic and fry for about 10-15 seconds. 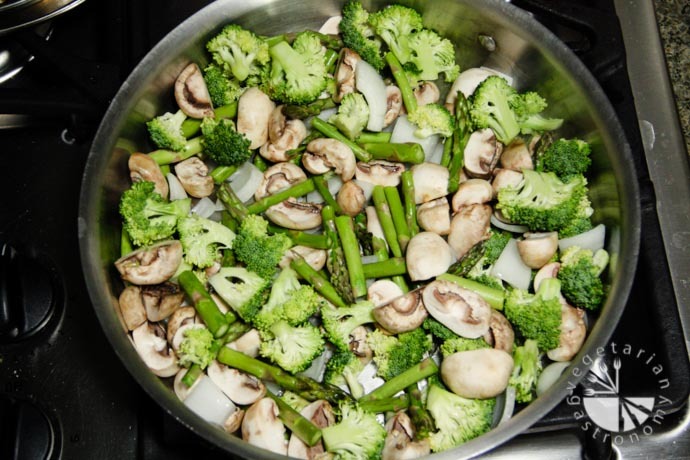 Add the onions, mushrooms, asparagus, and broccoli and toss to combine. Saute until all the vegetables are cooked and tender, yet still remain crispy. Note that all the water released from cooking the mushrooms should burn off while sautéing the vegetables. To Prepare the Sauce. Whisk all ingredients listed under sauce above. Mix until all the cornstarch has dissolved. Add more chili sauce if you prefer more spice. As always, I recommend tasting the sauce prior to adding it to the dish to make sure you have the right amount of sweetness and saltiness (especially if you have a Hoisin Sauce that is different than one of the ones I recommend above). Once the vegetables are tender and crispy, turn the heat down to medium-low. Add the rice noodles and combine (if you find that some of the rice noodles are stuck together, try to separate them when adding them to the vegetables). Slowly add the sauce and toss with the vegetables and noodles. Mix frequently until the sauce starts to thicken and coat the vegetables and noodles. Be sure not to burn off all the sauce (this should only take a few minutes). Turn off the heat and add some freshly chopped basil. Mix once more and serve hot! I made this for lunch for Akash and I today! It was super easy and quick and tasted delicious! I can see this becoming a staple in my kitchen. Yay you tried out this recipe - the sauce is so versatile and the flavor is great! Were you able to get the Hoisin sauce from Koon Chun or did you use a different brand? I live in Kailua Hawaii so where can I find Koon Chun hoisin sauce? Hi there! If you click on the link for the Hoisin Sauce I provide in the ingredients list, it'll redirect you to my post on Koon Chun Hoisin Sauce for more info, including where you can find it. I'm not sure if any stores in Hawaii carry this particular brand of Hoisin Sauce, but you can easily buy it on amazon. Click on the link below and you can purchase it from there:Koon Chun Hoisin SauceYou can also check if they have the Sun-Luck brand Hoisin Sauce.If all else fails and you cannot find the brands I recommend, find a local Hoisin Sauce that you like the taste of and go from there. This sauce is basically comprised of Hoisin Sauce, soy sauce, and chili sauce. The Koon Chun Hoisin Sauce is on the sweeter side, and therefore the amount of soy sauce I add balances out that sweet flavor. So depending on how sweet your Hoisin Sauce is, you may need to adjust the amount of soy sauce. But as long as you like the taste of the Hoisin Sauce you are using, you should be fine in terms of flavor.You can also use the sauce from my Tofu Veggie Stir Fry in this dish. It's comprised of ingredients that should be readily available: brown sugar, soy sauce, corn starch, chili sauce.Hope that helps! Let me know if you have any other questions! Hope you get a chance to try out this dish - it's really easy to make and very tasty! I buy this particular shape of noodles from 99 Ranch Market. Any Asian market should also carry them. Unfortunately I have not seen them at stores such as Ralphs or Vons. 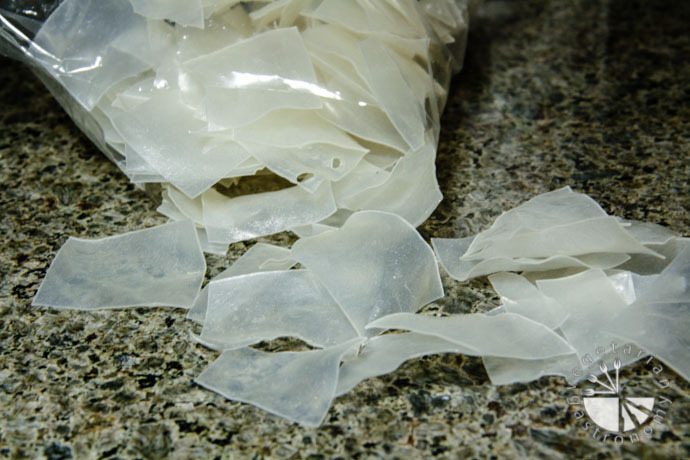 I actually love using this shape of rice noodles, but in case you can't find it, you can always use the long flat wide rice noodles, which you can find at most grocery stores in the Asian section.I'm really excited for you to try out the Hoisin Sauce...it's my favorite! After these noodles, make the Thai Basil Eggplant dish...it's one of my post popular dishes! Let me know how it turns out for you! I made this tonight - with broccoli, mushrooms and carrots as I didn't have asparagus. Came out great! I hope I do see that drunken noodles recipe on here as I am obsessed with it. Awesome! So glad you enjoyed this dish - it's super easy and very adaptable to different veggies you have in your fridge! I just finished developing another typical Thai dish that I'm super excited about, so watch out for that post sometime soon! And yes, Drunken noodles are definitely on my list of recipes to develop. Once I post that recipe, you'll have to let me know how you like it!In the meantime, if you like Thai food, get the Hoisin Sauce I recommend and try out my Thai Basil Eggplant if you haven't already done so! Thanks again for the comments! Anjali, I tried this recipe today for a big family lunch. Made enough to feed 25 people. The dish turned out great and was a hit! Your recipe was easy to follow too. Thank you! Wow 25 people - thanks! I feel honored...so happy it was such a huge hit! I love this noodle dish, especially since you can easily add any veggie and whip up the sauce in no time. Hope you get a chance to try out some of my other popular Thai dishes. Yum - I just found this recipe and made it for my folks. We all loved it! We didn't have broccoli but we did have carrots, bean sprouts, scallions, and tofu that I dried and fried to add. We also used some honey in the sauce and added a scrambled egg which made this taste a little more Pad Si-Ew-y (my favorite Thai dish!). Thank you so much! This was quick, easy, and delicious. Awesome! 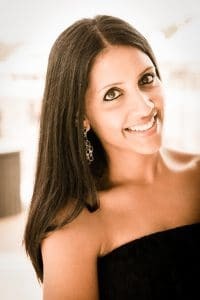 This is my go-to recipe especially when i have tons of veggies in my fridge...the ones you used sounds great! 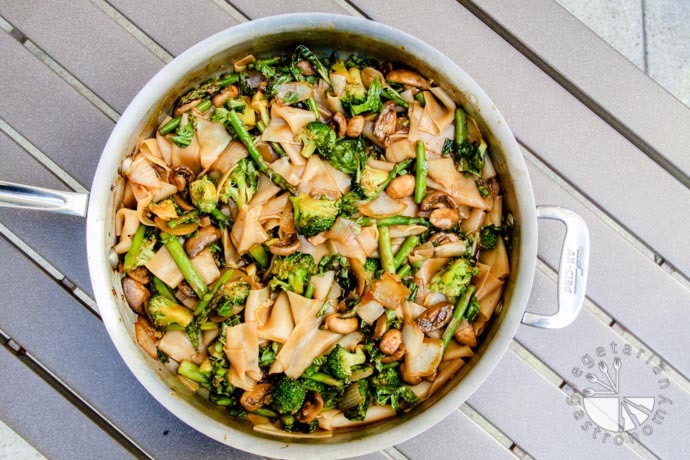 Pad Si-Ew is my favorite thai dish as well! Glad you and your family loved it and thank you so much for letting me know! I’m so glad I found this recipe. Made it tonight and it tasted great! I tried the Thai Basil eggplant recipe too and that was also great. But I love the extra crisp of the broccoli. Thanks so much! Thanks so much!! Yes...love my veggies tender yet crispy :) I have a ton of other asian inspired recipes hope you get to them! 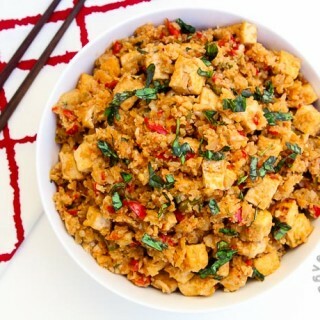 The garlic pepper tofu and chili lime tofu are great! Made this tonight - so delicious, thank you! Thank you!! YES...you and me both...LOVE pad see eww! I am working on a recipe so stay tuned! This is not pad see eww but delicious nonetheless. 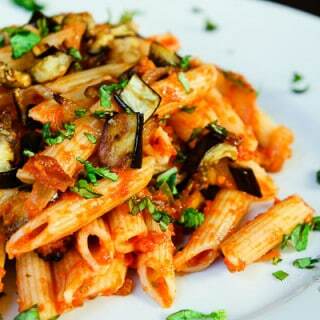 And YES...the eggplant and this noodle dish is a reader favorite! I will work on creating a pad see eww recipe soon! Thanks for the notes! So for rice noodles, the best way to keep them separate post cooking is to cool down completely and then drizzle some olive oil and gently massage them in until you're ready to use them. For the veggies, I cook the at HI heat and mix frequently to a void exactly what you're talking about...some veggies mushy and others still not cooked. That way they're all tendere yet not mushy. I'll check the recipe and make usre to add these notes in. thanks for trying it out and glad you liked it!